Expected publication: June 4th 2013 by Henry Holt and Co.
Ha! I began reading the second book in The Grisha series with high expectations. HIGH expectations. Leigh Bardugo didn't just satisfy my expectations, she surpassed them. Pause for moment of blatant idolizing. 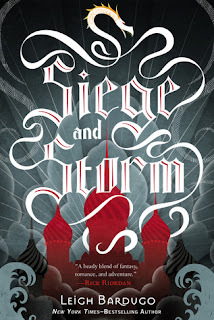 Siege and Storm continues Alina's story as sun summoner of Ravka as she and Mal journey away from the clutches of the Darkling while searching for another piece of the ever-expanding puzzle. For at the heart of The Grisha series is a puzzle: the parts Alina believes she needs to defeat the Darkling once and for all. But her quest is dangerous--both physically as well as mentally--as power continues to control her actions, despite Mal's objections. Their relationship deepens amidst the splintering as both change and grow more defiant in their beliefs. New allies are made, a mysterious pirate is introduced (another great character to like) while others return to the forefront, perhaps changed or not, and all kept me addicted to this unfurling fantasy. What I thoroughly liked was how the author manipulated the reader through plotting, devices, surprises and twists. The story did slow down in parts so the reader could think and re-energize and breathe before taking off once again to lands/places/destinies unknown. The mystery deepens from where exactly did Alina and Mal come from to what has happened to the Darkling? Can he be stopped? Can he be more complex? Talk about epic. The story goes in places I never imagined, still surprising and exciting. It's not fair to spoil the story by revealing too much so I won't. Fans will not be let down. 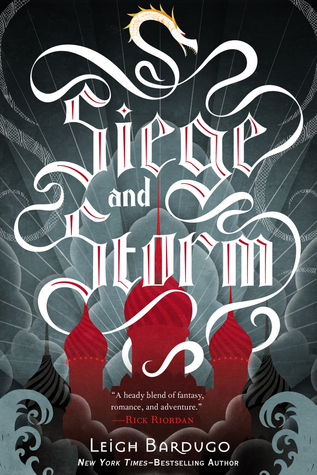 If you enjoy/love fantasy, it's time to jump aboard The Grisha train. I simply cannot wait for book three and more of my favorite YA fantasy series. Again, awesome! Digging the dragon and the Ravka kingdom in red (foreshadowing, hmm). I received a promotional copy from the publisher.